Searching out squeaky little pikas, analyzing rocks, and studying vesper sparrow genetics-- an exciting and wide variety of scientific research has been taking place within the monument over the past several months. Each year, the Friends Research Fund awards research grants to undergraduate and graduate students who are interested in pursuing a faculty-supervised project that enhances an understanding, appreciation, preservation, and/or protection of the Cascade-Siskiyou National Monument. Read on to hear from our most recent recipients and see what they have been up to on the monument! Emily Lind, a graduate student studying Environmental Education at Southern Oregon University (SOU), is studying the Vesper Sparrow with the help of her SOU faculty advisor, Dr. Stewart Janes. She is currently using genetics, morphology, and vocalizations to determine if the Vesper Sparrow population in the Cascade Siskiyou National Monument is the Oregon Vesper Sparrow subspecies (Pooecetes gramineus affinis). This research is important because the Oregon Vesper Sparrow population is estimated to be fewer than 3,000 individuals. “Throughout the spring and summer of 2018 we captured 26 male Vesper Sparrows at Howard Prairie. We collected feather samples for future genetic analysis, and morphological metrics for all birds captured. We also recorded vocalizations from 25 individuals from the Rogue Basin, Willamette Valley, and Great Basin populations combined. All of this data will be helpful in determining subspecies distinctions between the Willamette Valley, Rogue Basin, and Great Basin Vesper Sparrow populations. Because the Oregon Vesper Sparrow is currently being petitioned for listing under the Endangered Species Act, this research is timely. 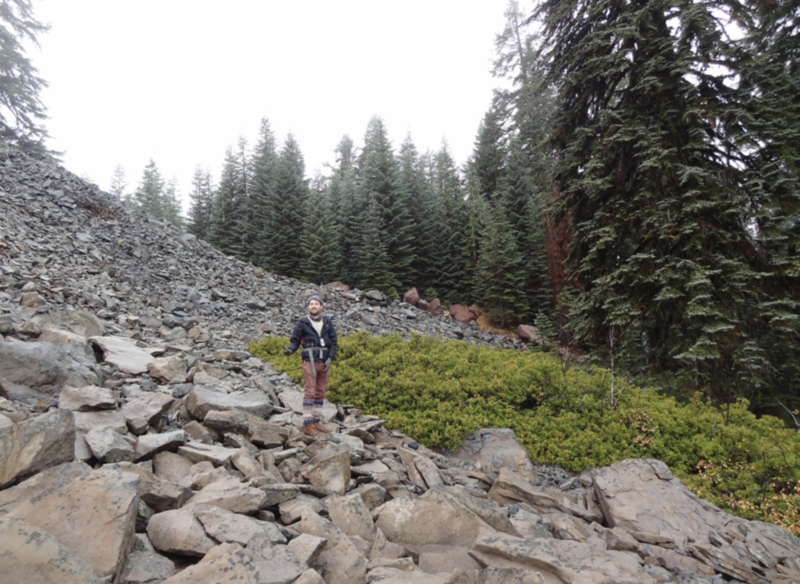 Dylan Carlini, an undergraduate student studying Geology at the University of Oregon has been working with his SOU faculty advisor, Dr. Jad D’Allura, to map and geochemically analyze the rocks of the Western and High Cascades. The goal of his research is to gain understanding about the nature of a strange variety of contact igneous (or altered) rocks between two major rock units. Neil Clayton, an undergraduate student studying Environmental Science at Southern Oregon University has been researching the American Pika (Ochotona princeps) with the assistance of his SOU faculty advisor, Dr. Jamie Trammell. Through observation of the pika and their surroundings, as well as exploration of possible sites suitable for habitat, he intends to describe the distribution of the species within the Monument. “My research began immediately following the acceptance of my award this year. I completed a majority of the work that was to be done in the lab in which I used GIS to create maps that may help to describe the distribution of pikas in the monument. These maps were created also to predict the places in which pikas may be found, considering all the habitat requirements. A meta-analysis of scientific journal articles, from historical to current, was conducted. The information extracted from this analysis was used to determine variables that were input into GIS and habitat suitability models were created to predict where pikas may be found. Data was gathered by my research partner from the NPS and their current pika monitoring program. These data points, which represented current, verified pika occupancy in environments similar to the CSNM were used to create a different type of habitat suitability model to predict pika occupancy in the monument. As new data is collected and added to the models, these maps will be combined to show current and historical occupancy in the monument. I spent time in the field in other locations around the Pacific Northwest with a pika ecologist that works for the USGS in order to understand the way in which pikas are monitored by the USGS and the NPS. I then returned to my sites in the monument and applied these techniques. This was a great help in understanding the distribution of pikas in the monument. With this greater understanding, more data was collected and more questions arose. I spent the entire summer either in the field at pika sites in the CSNM or at other locations in the PNW. There is now a somewhat clear picture of occupancy across the monument, mostly along Surveyor Ridge. Come and hear more about these students’ research findings at our annual Monument Research Symposium at SOU on March 14th, 2019! Save the date! Interested in helping foster student research in the Cascade-Siskiyou National Monument? Donate to the Friends Research Fund today! Neil Clayton, researching American pika, taking data along Surveyor Ridge. Evidence of pikas haypiling. This type of evidence shows current occupancy. The plant material found in these haypiles has been identified and taken as data in order to try to understand the diet of pikas in the CSNM and how that may differ from other populations. The most common pika predator, the long-tailed weasel, at Vulture Rock. Photo taken by Neil Clayton, student researcher. Dylan Carlini on top of a basalt vent. This is the location a large amount of lava would have erupted from, forming a small hill. The hammer is for smashing open the rock to get at the fresh surfaces. A large chunk of andesitic basalt. Notice what appears to be a lighter colored rim, and the light-colored veins. This rock is a bit of a mystery, and we see it at the bottom of a specific unit. The mixed nature of the colors is an ongoing area of research for us. Photo by student researcher Dylan Carlini. Dylan Carlini on a basalt dike. These features are elongated fissures that the lava erupted from. They sometimes lead to a vent but can also exist on their own. These dikes are particularly interesting as they appear to curve, though we are continuing to investigate.